Are there any risks to leaving Varicose Veins untreated? Will the veins get bigger over time? True varicose veins can result in significant medical complications. Bleeding, thrombophlebitis (blood clots), and ulcerations (large sores) may occur if varices are left untreated. These complications are the result of the excess pressure and sluggish flow in the veins. 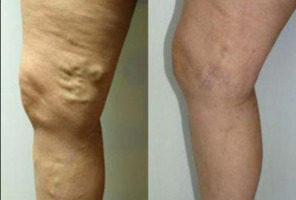 Varicose veins can be left untreated. What happens over time is that more veins will form, your risk of developing superficial thrombophlebitis increases, there is always a potential to bleed from the veins and, ultimately, there is the risk of developing chronic venous insufficiency from persistent venous hypertension, which can lead to ulcer formation. The medical management for varicose veins is to wear support hose (compression stockings). The disease progresses over time. The veins get larger but more importantly the circulation continues to worsen. The first symptoms are swelling, followed by itching, skin inflammation and discoloration and finally ulcerations that are a very difficult problem to deal with. Additionally superficial phlebitis (blood clots in the varicosities) can become a recurring problem. These problems can be forestalled with religious wearing of compression stockings. The natural history is that of slow progression. So yes, left untreated, varicose veins tend to enlarge. There is a less than 1% risk of developing skin changes which predisposes one to the formation of skin ulcers. Varicose veins can be treated conservatively with venous compression hose. With compression hose you can slow the progression of the varicose veins and their related symptoms. Generally there are few risks except progressive enlargement of the veins with associated pain. Occasionally they can develop phlebitis(inflammation and clots) but this is uncommon.